Over the years since the introduction of the MGF in 1995, there have been a number of radical MGF concepts developed, and those that entered the public domain are chronicled below. The MGF Cup Car - fully rose jointed suspension, seam welded body, monster brakes, and the 190 bhp VHPD engine. A true extreme MGF! Arguably the first and perhaps one of the most extreme performance MGFs yet unleashed, the MGF Cup (launched in January, 1998) was never intended as a road car - but it is very closely related to its road-going brethren. Differences can be found in a number of areas, including the body monocoque (fully seam welded, as indeed were the subframes), suspension (fully rose jointed, although Hydragas retained, it operated independently on each wheel), brakes (AP Racing calipers and discs) and engine (190 bhp VHPD with dry-sump lubrication). These fully-prepared race cars cost a cool £24k when new - and are not road legal (they probably would require SVA type approval). But that said, they are awesome and easily the most numerous extreme MGF variant currently available! In fact, they are the only extreme MGF available to the general public! 10 years after their first appearance, many have been converted either to look like the newer MG TF (and are still competitive in the Abingdon Trophy, run by the MGCC), or are now in private hands as Track day stormers! Unlike the experimental prototype EX181, the EX-F was not a costly, ultimate-specification, silhouette MGF (a facsimile of the road car stretched over a space-frame chassis and race car components), but a genuine, albeit modified, road-going MGF, using Rover Maestro diesel van hubs, Rover 100 steering gear and skinny wheel rims, that turned out to be space-saver spare wheels from the Rover 800! These wheels had aerodynamic covers that looked, for all the world, like orchestral cymbals. EX-F retained the MGF's standard body shell, into which was inserted a roll-cage (constructed to the organising Southern California Timing Association's regulations). The MGF's aerodynamics were carefully worked upon over 32 hours of windtunnel testing, in which time the tail was extended by 400mm to improve stability. Chief aerodynamicist, Jeff Howell's meticulous work on EX-F sliced the coefficient of drag from CD 0.37 to CD 0.24. Attention to detail was key: closing off the air intakes at the front of the car cut drag and lift and painstaking taping over of the car's panel gaps before each run minimised surface imperfections to yield an extra 1.5mph at 200mph. Completing the aerodynamic package was the distinctive, F-15 like glazed bubble top, blow-moulded in house in Rover's experimental/prototype shop. Phil Turner, in charge of the chassis concept for the MGF road car, honed the record-breaker's underpinnings. The chassis retained the standard Hydragas suspension, but discarded its anti-roll bars: cornering was irrelevant on the vast Bonneville salt flats! The rear tyres were narrower than the fronts - but not through choice, they were the only suitable sizes that Goodyear made! The record-breaking EX-F's specification was completed with the installation of a heavily modifed and turbo-charged 1,433cc Rover K-series engine, developed in co-operation with tuning specialist Janspeed. This engine produced an incredible 328bhp at 7,000rpm -more than double that of the standard VVC roadcar's 143bhp at 6,250 rpm. Wow - what a concept! But crushingly impractical. Note unique features of rear spoiler, diffuser, centre exit dual exhaust, 8-spoke wheels, and windscreen-less styling. The white interior was a pile of pants though. 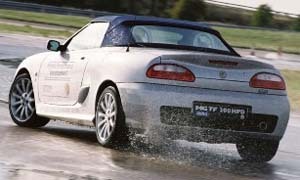 Also known as the EX254, the very first high-performance road-car derivative of the MGF was first seen at Geneva in March 1998. Not a car for the shy at heart, the concept was for a weekend race car: a car that could be driven to the track, raced, and hopefully (exurberance permitting!) driven home again at the end of the day. Changes were extensive. Visually, these were very obvious, from the new front and rear bumpers, swollen wheel-arches stretched over 8-spoke minilite-style alloy wheels shod with 210/605 R16 race tyres front and 220/640 R17 race tyres rear. The windscreen frame was ditched too - replaced by a perspex aerodynamic flaring to keep the bugs out of your teeth, with roll-over safety protection proved by a welded-in roll-cage with a single hoop behind the driver's head. No so obvious to the eye was the uprated race-spec suspension (inherited from the MGF Cup Cars), coupled to a Supercharged 200Ps K Series engine, co-developed with Janspeed. Stopping this potent combination was the responsibility of a set of anchors provided by AP Racing. This was a massively desireable project - although in the form first shown was far too compromised for a vehicle costing twice the amount of the then-entry 1.8i MGF model. The ill-fated EX255, seen here in mock-up guise, sans aerodynamic front wheel splats. Buoyed by the success of the previous year's EX-F based assault on the 1100-1500cc class Land speed record, the MG team saught another crack at the previously-set MG speed records - particularly Phil Hill's 1959 254.91 mph record set in the larger capacity, revised EX181. And thus, the EX255 (255 mph, get it?) was born under the stewardship of Nick Stephenson. 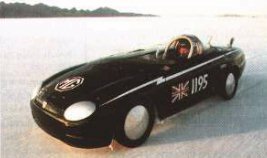 The driver of that years' attempt was to have been Andy Green - the worlds fastest Man (in Richard Nobel's Thrust SSC). 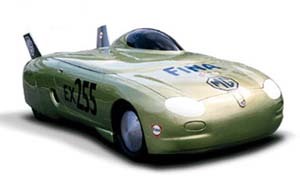 Andy Green approached MG when news of the return to Bonneville reached him the previous year (the EX-F project) and he offered the company his full support during the development of the EX-255 project. To accomplish a top average speed in excess of 255mph, the EX255 required a power unit capable of producing over 900bhp. The venerable Rover (Buick) V8 engine was chosen for the attempt - an engine that certainly isn't alien to MGs - this same engine having found its way in albeit more modest tune, into the MGB V8 and MG RV8. To get the required 900 bhp, the engine was extensively modified and tuned, with air force-fed by twin superchargers. Unfortunately the project was destined for disappointment; due to modifications required to the air induction system in order to provide more power, the project simply ran out of time and missed the event. Supersports sanitised: now available with a windscreen and a hood - what luxury! Pictured below in final chromaflare painted form. Released to the viewing public in March 1999 at that years Geneva motorshow, the 'Mk2' MGF Supersports was sanitised when compared to the extreme, windscreen-less machine launched at Geneva the previous year, and consequently looked much more of a realistic sales possibility. Broadly speaking, the mechanical specifications of the car remained identical to the earlier concept - that same (proposed) supercharged engine, the same brakes, and similar sized wheels (albeit of a different style). Principle changes were of stylistic and practical nature - the mad white-leather interior was ditched in favour of a more convential interior style, and happily the windscreen and weather protection made a welcome come back! Estimated sales price was put at £27k - 10 grand more than the entry level car. There were very vocal members of the MG team that felt that the market would not accept such an expensive MG. And thus, tragically, a combination of internal wrangles and BMW-led management edict killed the car. Is this the last we'll ever see of the MGF SuperSports? Computer generated image of the proposed Extreme MGF. The MGF X-Power concept previewed the 'Extreme derivatives' that the new owners of MG had in mind for the brand. The X-Power 'Extreme' models were intended to be derivatives of existing MG vehicles intended to link the motorsport programmes and the mainstream roadcars. The whole design brief was intended to encapsulate the new MG X-Power ethos - 'outrageous fun.' These cars are (sadly) to be one-off vehicles, built for demonstration and promotional purposes. However, they are truly outrageous! 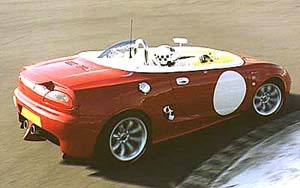 The 'MGF Extreme' was first "revealed" in May, 2001 with a computer-generated mock-up of the finished car, as shown opposite. The car was to be powered by the 450 horsepower MG XP20 'X Power' Le Mans engine - and allegedly road legal - gulp!!! Larger wheels, functioning aerodynamic body features, larger side air intakes, lower body side mouldings and bonnet vents complete the X-power vision for the MGF. The MGF Extreme was released before the MGF Mk3 - or TF as it became known when MGR 'relaunched' the car. The Extreme F has since been renamed the MG TF X-Power 500 Extreme. The fundamental concept behind the MGF Extreme is fundamentally different to the Supersports in that it was only intended to be a one-off, and not available to the general public. In June, 2001, the MGF X-Power 500 Extreme was manifest in the metal, for all to see at the MGCC Annual meeting at Silverstone. Wow. All that had been promised was there to see - complete with that race-bred 500Ps engine and 6-speed sequential transmission, in what is a much modified MGF monocoque structure. While externally MGF X Power 500 appears radically different from the standard car, much of the original structure remains. The body is seam welded throughout and has a fully integrated cage. Front and rear subframes are modified to accommodate the new powertrain and handle the 3-fold increase in power output. The track becomes 100mm wider at the front and 150mm at the rear. Four-pot AP Racing brakes ensure effective stopping performance. Wider tyres are specified for the task of managing the extreme power available 225/35 R17 at the front and 265/35 R17 at the rear on MG multi-spoke alloy wheels. Engine cooling is optimised by an increased radiator capacity, fed by a much larger aperture in the front bumper and exiting through vents in the bonnet. The side air intakes are also enlarged to feed cold air into the engine bay. Inside, race seats and competition harnesses ensure the occupants remain firmly in place despite the very considerable g-forces the MGF X Power 500 is capable of generating. The MGF X Power 500 is not for sale, but has been developed to be outrageous fun. I don't doubt it! The MGTF 'Hybrid Performance Development' or HPD, is an incredible hydrid develop undertaken with great secrecy with MIRA. Incorporating an additional 40Ps electric motor powering the front wheels in addition to the 160Ps VVC petrol engine driving the rears, this is a genuine 200Ps, 4WD roadster! Perhaps more incredibly, this is all achieved without harming the fuel economy of the already efficient VVC motor. Does packing the bonnet space with an extra motor harm the weight distribution and handling? Apparently not: the weight distribution now rests at 50/50 front to rear... Can you buy this car in your show room? Er, no, not yet. Indications are that this technology may find its way into motor sport first, and then filter down to us mere mortals later as the technology matures. Read more about the 200 HPD here. A very interesting development - I hope to see more of cars like this in the future. Want to read more about the 200HPD's other key credential - its aerodynamics? Read more here.